When a canvas is made it is stretched on top of a wooden frame. Canvases are primed using a white paint, or surface coating called gesso. Gesso turns the surface of a raw canvas into a smooth surface that can be painted on. There is no rule that says you have to do it in this order. Any canvas can be primed, painted on the stretched whenever it’s needed. When a primed canvas is ready for stretching, it can be gallery wrapped. Gallery wrapping do not have visible staples. The painting itself can be extended to both sides and this style of wrapping does not require a frame. We need to assemble the stretchers. The corners should fit into one another and the ends have notching. The sides with printing or number should face the back of the canvas. Check that your stretcher corners are even and square. Lay your frame work flat on your workplace. Measure the frame diagonally from the top left corner to the bottom right and the other side. The measurements should be the same. If they differ slightly, then you can take a rubber mallet and tap the corners to make the alignments correct. Remeasure and repeat until the measurements are the exact same. Place your canvas on the work table, primed side up. Set the wooden stretcher frame on top of the canvas. Make sure the canvas is centered. Lift the corners of the canvas and use a pencil to mark where the placement of the canvas fits properly. Turn the canvas facing the prime side down. 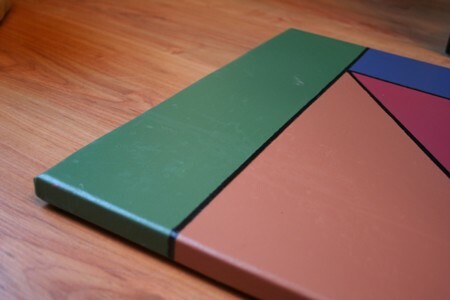 Place the stretcher frame on top of the back of the canvas. Use the pencil to mark the position. Pull the canvas to the top of the stretcher. Over lap the canvas over the edges. Make sure the canvas is flat and pulled taught. Secure it in place with the staple gun. The staples should be in the center of the canvas. Repeat this for the other sides. Staple each side in place. Repeat the stapling and create a row of 3. Each should be about 1 inch apart. Fold the corners of the corners of the canvas back and staple the canvas down at each corner. Make sure the canvas is neat and smooth. Feel free to add any additional staples as you see fit. Make sure you work down either side. This is guarantee that your canvas is tight and secure over the stretcher.